No Part of It, the Chicago label run by the eloquent and prolific Arvo Zylo, released a new batch of CDRs at the end of October 2018. Here’s another compilation, this time about cats. Yes, really, cats. Not, you know, some derogatory term pointed at effeminate males (jock culture is the pits! ), just in case you were wondering. Literally about, often by, in some way, cats. It’s OK, you can do a double take, blink a couple times, and shrink away, never to return to this subject again. Or you can embrace the weirdness, the inventiveness, of this idea and run with it. Your choice. Have fun or don’t, I don’t care. Pussification always meets this criterion. Sometimes it has cat noises. Sometimes it is made with other cat interaction. 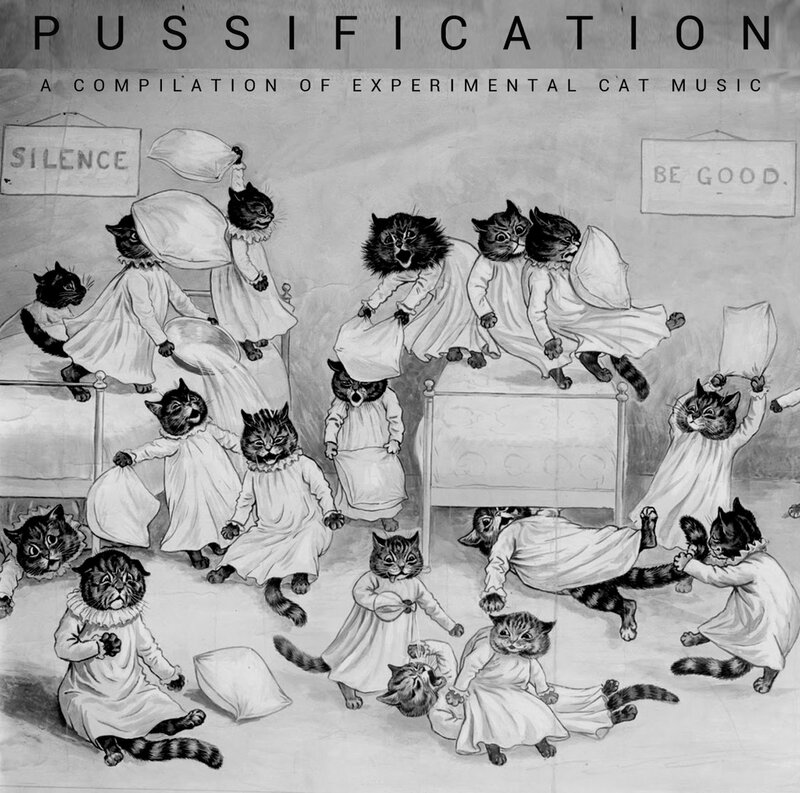 Sometimes it is made specifically for cats (I’m looking at you, Le Scrambled Debutante – “Stolen and Contaminated (Meow Mix)” is strictly a song made to entertain felines). All of it is cat related. And it’s fascinating to hear what everybody comes up with. Fhtagn’s “The Chase” sounds like stalking prey and then the pounce, as realized by classical string instruments. The Rock Cats’ “The Rock Cats Are Your New Favorite Band” is a single minute where you can imagine cats as a literal rock band (which somehow totally works as a meme in my head). Of course there’s a track called “Cat Scratch Fever,” by an artist named Hari Hardman, that sounds like cats knocking stuff over and screeching (and still ends up better than the Nuge’s tune). Of course Arvo himself shows up with “Primordial Blues (w/ Chollie),” a slow-build noise sculpture of … Chollie eating? Am I right? It crescendos to a static behemoth that lends an uncomfortable dread to whatever it is the cat’s actually doing. It’s just a good noise track, in the end. So, are you a cat lover? A musician? Both? Then grab one of these and fall in love with your pet all over again, or become inspired to do something out of the ordinary for it. I’m sure your cat will appreciate whatever it is you end up doing. Either that or it will stare at you indifferently before marching huffily away.